Interests:Anything is better than shoveling snow. I use manual and automatic engine controls and I can not stop Spitfires oil from overheating. I keep the throttle pulled back out of boost pressures, full manual Radiator 100%, propeller at 80%. I can not stop the oil from overheating after about 20 min. This cannot be realistic, sure they ran hot idling on the ground. But in the air at cruise settings B.S. Is there something I am missing or do Spitfire SIM pilots just fly short sorties due to broken Gaijin aircraft? It would be more helpful if specific circumstances were provided. Spitfire model, terrain (Outside air temperature greatly affects engine overheat behavior), flight profile flown and the results. With that information I can fly the same profile and compare the results and determine my opinion on what is going on. I just flew the Spitfire Vc in test flight/reference. Oil and Water temperature behavior is in line with other liquid cooled aircraft in the game and actually much better than some others. Without specific information I can test against I don't see an issue with the Spitfire behavior. Interests:Things that go boom. Making people rage quit. I flew the first spitfire in the tech tree (I forget what model it was) in a RB match. I don't think I went above 5,000 ft and had to keep the throttle near 80% to keep from overheating. I currently have no mods for it. I also took it out into a test flight (simulator) and don't recall having any overheating issues. I haven't had a chance to take it out into a sim battle yet. I also don't use manual engine controls. Flying an unmodded aircraft in auto engine control will result in fast overheat no matter the model. I just alerted and saw this thread. Observing and will help in data gathering once, as Dawger asks, more details provided. Try 60% prop pitch, they can handle it. Worked in 1946 and CLoD Blitz, works here. I don't have time to go in detail, but I suggest you google the spitfire manual and have a look to rpm instructions. Edit: Did that for you. Copy that to your behaviour and you will see it is working as intended and pretty good displayed in game. Especialy the time limits are important and give you and idea, where your problems come frome. As you see, the rpm counter is your best friend in spits. The overheating in the Mk. I and II spits is a bit exaggerated but can generally be dealt with using mec like everyone else in the thread has said. I don't think it's a bad thing to require mec but i do think it needs to be more consistent since planes like the F4U or Spitfire require mec to fly effectively but many others don't which gives them an unfair advantage. Some planes also have completely broken MEC that doesn't work like the Ki-45 and a few other multi-engined planes. What can't be dealt with is the horrendous stability issues that every single spitfire in the line seems to have where they're constantly flopping around and trying to flip over. I've flown Spitfires in at least 3 other different simulators and none of them behave even remotely close to how they do in Warthunder currently. You can tell something is horribly wrong just by taking off because you can get off the ground in 3-5 seconds at way below the speed you'd expect the plane to stall and no WW2 fighter behaved like this even many biplanes don't behave like this. It isn't an issue you can just fix with trim either and it's the main reason that literally nobody is flying spitfires in SB at the moment especially at lower tiers. Sure you CAN fly spitfires and get kills in them but between the horrendously broken flight model, the dramatic overheating, and the unfavorable matchups it faces in the 109 E-1 and E-4 (both of which also have broken flight models) they're just painful to fly now. for spits you just need to lower RPM. The only problem is that they will eventually overheat at temperatures lower than manual says. 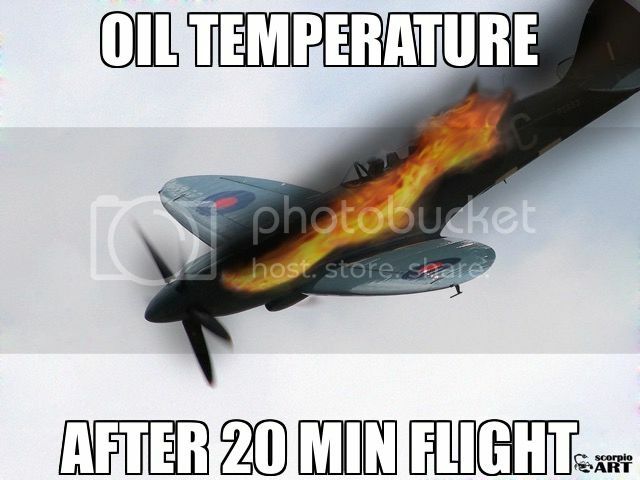 Things is that they do have time limit on those temperatures of 20-40mins so in test flight it's very unlikely for you to see it but if you fly in battle and you use 1hr setting for say mk Vb spit you will find out that even if you keep oil temperature as per manual it would still overheat after around 30 mins. work time is how long it takes (in sec) for engine to start taking damage at certain temp level so as you can see mk I spitfire will overheat at 80C oil after around 20mins and will start to take damage after exactly 1800s = 30mins. you can also see that at 75C it will overheat after an hour and since you get that temperature in cruise you have more than enough fuel to do that - of course it's rare for one sortie to take that long but 30mins is not that uncommon. Of course this is not spit specific problem but since spits have so unforgiving thermodynamics it's much more problematic here. Also - spits (and other planes but spits have it "more apparent") have totally busted engine behaviour at partial throttle. Just take mk V or mk IX and try flying at cruise settings of +4lbs and (I am going from my head so re-check) 2600rpm. Engine will generate .. 100hp which is not enough to even fly. Also all planes have throttle behaviour problem where throttle is not MAP governor but partial throttle have same critical altitude as full throttle. @Chuck_RCAF - outsie combat always keep RPM below 2550 (75% if memory serves) and once you are done climbing lower RPM down to 2200-2300 (ca.50%) and keep throttle at 90-100%. You will still get good 700-800hp which is even enough to climb but you will keep engine cool. Wow just tested MkII and they must have fixed engine thermodynamics, compared to 6 moths ago. Keeping those settings and speed above 180mph allowed me to climb to 5km. It should last 30min as manual states, but at around 2km the oil temp starts going yellow at 87C. Continuing this it raises to 88-89C wihtin next 5-10min. At around 4km the 88C goes red which game mechanic treats as overheating oil and already damaging engine. Now interesting thing - as I passed 4500m, suddenly temp drops down drastically. Within 15 seconds it went down back to 87 and then disappeard. By that time I reached 5000m altitude. Does it indicate that in WT the air temperature doesnt drop 1C per 100m but there are some simplified threshoold altitudes for different air temp??? So definitely not 30min but around 10min still I could constantly climb to 5km which is quite good. no - it indicates that above critical altitude your engine start generating less power (due to lower boost) and that means it generates less heat. Add temperature gradient on top of that and voila. My main concern was the Mark I, I was trying 80% prop pitch and just below red line on boost which equals approximately 70%. I didn’t realize I would need to reduce my throttle even further. I will monitor my RPM based on specs given. At such reduced settings I think biplanes would be faster, perhaps I am exaggerating. 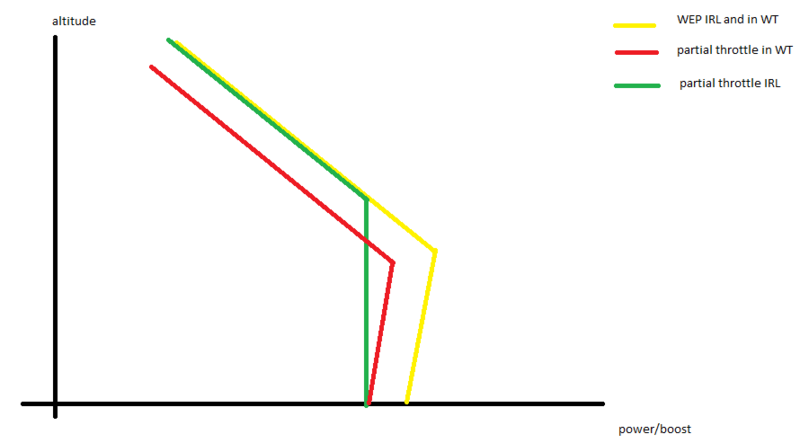 i wonder if Gaijin has stats on how much the low level Spits are being used. Seems like a waste not to be able to fly a nations most symbolic aircraft. P.S. Once an oil temp rises it is nearly impossible to lower it again. I will fly the the Mark I in test flight and see what happens. I didn’t realize I would need to reduce my throttle even further. I will monitor my RPM based on specs given. Thank you so much. I am also having Mk I overheating issues. - radiator full open until temp drops below 84oC then 50%. At those settings I climbed to 3000m. I leveled at 3km and closed radiator to 50% after the temperature dropped to 82oC. At cruise settings above with rad at 50% I could cruise easily between 2000-3000m with constant oil temp at 82oC. No overheating. Reached speed of around 420km/h(260mph) at 2500m in level flight with those settings. Now I don't know the manual for Mk.I, but 84oC oil overheating in game seems a bit low. As with Mk.II - manual states 90oC limit but in game the overheating starts at 87oC. I think if they increase the oil overheating threshold by 2-3 degrees we would get a spit that can be flown with real life manual. Climbed to 3500m on WEP all the way. The oil temp went to slight yellow to 108oC and coolant 114oC when I passed 2000m and stayed there. I levelled at 3500m but probably could continue climb on WEP for another 1km easily. I levelled at 3.5km and reduced throttle to 100%. The engine cooled down down almost immediatelly, within 5-10 seconds and E4 can cruise at 3500m at over 430km/h at 100% power and half closed rads. - increasing RPM from 2800 to 3000 reduces the level speed by 4mph. - tests were carried out using 87 octane fuel with boost limited to +6.25 lbs./sq.in. Climb figures were achieved using the 2600 rpm 1/2 hour climb limit. By the Battle of Britain all operational squadrons had changed over to 100 octane fuel and the engine limits on the Spitfires had been increased to +12 lbs./sq.in. 3,000 rpm with 1/2 hour climb limit increased to 2850 - 3000 rpm. I flew the Mk 1a and it differs significantly from other models. The red area on the boost gauge starts at 4 lbs and the only way to keep the engine under 90 degrees is to stay out of this area. This equates to about 74% power. Using the cockpit gauges and real world technique I was able to keep the temperatures in the acceptable ranges but performance in relation to other in game models is greatly reduced. Whether or not this is historical would require significant research. I would need access to historical documents in their complete form to make this determination. if anyone has those please let me know. The red area on the boost gauge starts at 4 lbs and the only way to keep the engine under 90 degrees is to stay out of this area. Hmmm this does not match my tests. I have been flying at this setting for 15min. I tested in level flight going full WEP at 2800RPM and after getting oil temp to 88oC I reduced it to above settings and engine started to cool down. Radiator fully open. After tem reduced down to below 84oC I reduced radiators to 50% and that is pretty much continous cruising setting without overheating. This is test flight over Kent. You are arriving at the same place using a different method. Reduce one or the other and the total power goes down and, consequently, the heat. That's not the case in WT. 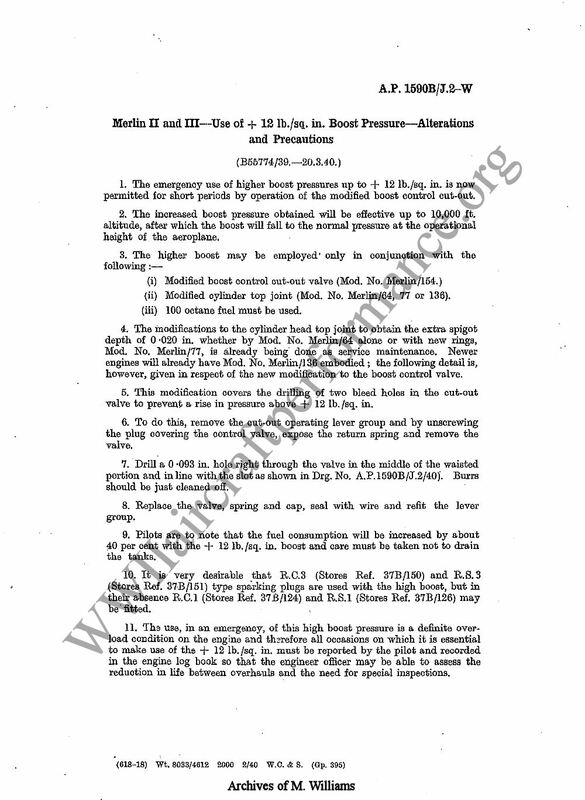 WT engine model prefers low RPM. When producing same power, low RPM / high boost is usually cooler than high RPM / low boost. How do you know you are producing the same power? A lot of info can be obtained through localhost:8111 with the browser. There is also a tool that can help to display and record info from 8111.
way less heat in fact. It's not spit specific - all planes have it but for spits it's much, much more visible and have much higher impact on heat. BTW - 1800rpm is kind of lowest RPM allowed for Merlin and you should not be able to fly it with +10lbs if memory serves but engine "resistance to overboost/lugging" stated in manual is usually conservative so I do not think it;s a bug here. Every single plane in WT works much better at 100% throttle and very low RPM setting compared to higher RPM and partial throttle. The same is btw true for RPM - when you lower RPM and boost drops (which is fine since blower is ran at lower speed) boost governor fail to keep power but act as certain percentage of 100% throttle through whole range. disclaimer: there are planes w/o boost governor but most of what we have in WT did have it.